As some of you might already know, Ari and I have been just all about our small Animal Crossing: New Leaf towns to the point of obsession. Who would blame us? It’s probably the best Animal Crossing game in recent memory. But surely, the monotony of pulling weeds, shaking trees, picking up fruit, planting flowers, and digging holes can’t be all that exciting can it? For me, it’s not really what you do in the game that’s important but what Nintendo’s tossed in it to entertain us. Personally, I find that the Kapp’n’s ballads to be the most endearing thing about Animal Crossing: New Leaf. 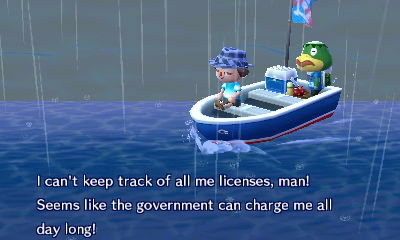 Whether it’s his mum’s comments about how her makeup being her suit of armor or his complaints about paying the government for too many licenses (he has driven a lot of different vehicles across all the games), Kapp’n’s words of wisdom are probably what makes me earn those 1,000 bells just to ferry myself back and forth just to hear his often nonsensical babble. Alas, tonight I wanted to hear some renditions of his songs online and lo and behold, I found a couple that I’d like to share with our readers. Yes, they might not be chiptune, but I feel they capture the essence of the Kapp’n’s messages. What’s your favorite Animal Crossing song? Share it with us in the comments!